Bush: Time Spent on Father's Presidential Campaign "Nominal"
Land Commissioner George P. Bush said Sunday he has put his "heart and soul" into his job amid questions about how much time he has spent working to elect his father president. 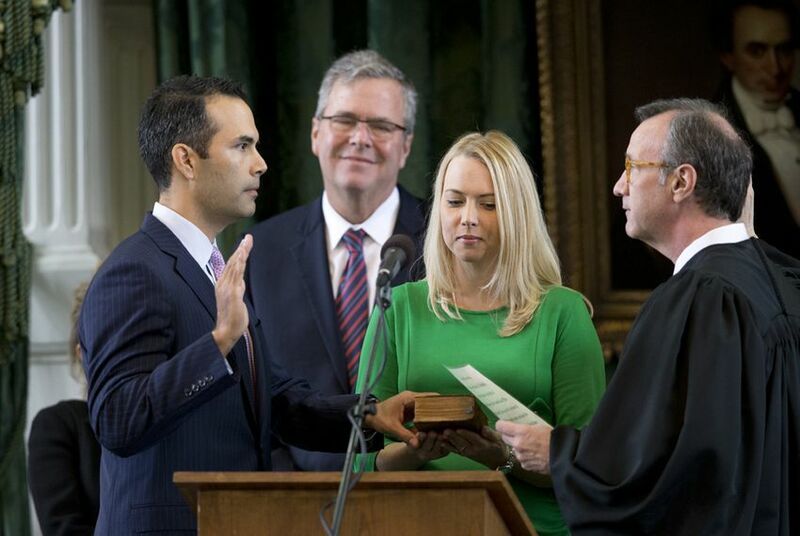 Land Commissioner George P. Bush on Sunday night rejected the suggestion that his involvement in his father's presidential campaign has significantly cut into his official duties, saying the amount of time he has spent stumping for his dad has been "nominal." In an interview with the Texas Tribune, Bush echoed his office's aggressive pushback throughout the day on a Houston Chronicle story that concluded he "has been out of the state or otherwise off of work nearly half of the time since his father entered the GOP race for president." The newspaper reported that Bush was away for the equivalent of 23 of the first 50 workdays after his father, former Florida Gov. Jeb Bush, launched his 2016 campaign. "I'm extremely disappointed by the findings," Bush said. "The evidence will strongly show that I've put my heart and soul into this position." In a letter to the editor submitted Sunday to the Chronicle, Bush communications director Bryan Preston wrote that the story was "not even close" to the truth. Bush "was either in the GLO office or doing GLO business around the state" 50 out of 63 workdays this summer, Preston said. Of those 13 days off the job, just over half of them were spent on efforts related to his dad's campaign, according to the land commissioner, who noted the tally does not appear to exceed the time he has taken for vacation. "Even looking at it liberally," Bush said, "the full extent of the amount of work days utilized in connection with the Jeb campaign is 7.5 of 63 days." Since his father entered the race June 15, Bush has been campaigning for him in the early voting states and helping him raise money across the country. From the start, Bush's aides have stressed serving as land commissioner is his top priority, and he would only hit the campaign trail as his official schedule permits. Bush's office argued that he makes up for his absences by working holidays and weekends as well as staying plugged in to the job when he is not physically in Austin. In the interview, Bush cited a WiFi-equipped flight in June to Austin from Las Vegas — where he was stumping for his dad — as one example of an opportunity to keep tabs on official work back home. "We live in a completely connected world," Bush said. "We're trying to implement that through the agency. We're trying to live by that. There's a lot of work accomplished when you're not physically in the office, and I think people recognize that." The dustup over the Chronicle report has resurfaced a question that has dogged Bush since he began running for office: whether the rising star in GOP circles can fully focus on the job amid rampant speculation about his political future. Asked if he felt additional pressure to avoid that perception, Bush replied: "In a word, yes. I knew that the expectations were going to be heightened coming in, and I tried to show a strong work ethic during my campaign," when he visited over 200 counties. Bush's role in his dad's campaign does not appear to be shrinking. He and his brother Jeb Jr. are leading a drive for young donors called Mission NEXT, and he is scheduled to appear at fundraisers Oct. 22 in Fresno, Calif., as well as Oct. 26 in Houston. "Moving forward, I think the campaign would like to have my help, but I've told them this is my priority," Bush said, later reiterating: "I'm just going to continue to put my head down, help out my dad a little bit whenever he needs it, but the focus is the here and the now and continuing our efforts of reform at the GLO."